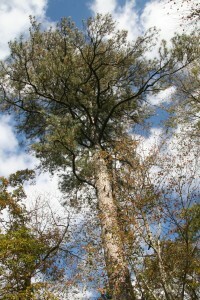 Loblolly pine is considered the principal commercial species in Delaware and it is predominantly found in the southern part of the state. Adaptable to a variety of sites, it seeds into open areas readily. Loblolly seeds are sometimes eaten by wild turkeys, squirrels, and some songbirds. On good sites the tree can reach over 100 feet in height with a trunk diameter of two to three feet. Loblolly pine usually has three needles (but sometimes two) which are usually 6 to 9 inches long.